Dual-phase extraction had been used on-site, however BTEX contamination concentrations remained high. Enhanced aerobic biodegradation using ORC Advanced applied via directinjection into clay soils. Post-ORC Advanced Application, BTEX groundwater concentrations below 10 ug/L. The Cambria General Store in Central California had a history of petroleum hydrocarbon contamination. Dual-phase extraction had been used in the past to treat the site and a total of 130 pounds of petroleum hydrocarbons were removed. However, contamination levels remained above regulatory levels. Contaminant concentrations included: benzene at 310 ppb, toluene at 8,000 ug/L, ethylbenzene at 2,700 ug/L and xyelene at 12,000 ug/L. THPg levels were measured as high as 14,000 ug/L on-site. The site was successfully treated with ORC Advanced which reduced BTEX groundwater concentrations below 10 ug/L. Site closure is pending. ORC Advanced was used to treat the residual dissolved-phase groundwater to California’s low threat groundwater levels. It was applied to two areas within a 1,200-square-foot treatment area. 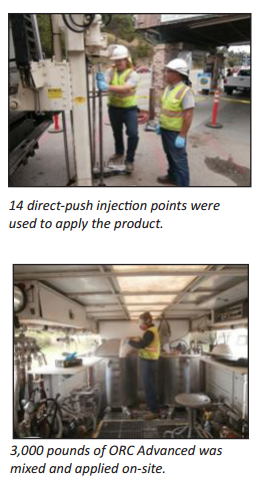 A total of 14 injection points were used to apply a total of 3,000 pounds of ORC Advanced with injection spacing of 7.5 feet on center. ORC Advanced is a proprietary formulation of food-grade, calcium oxy-hydroxide that produces a controlled-release of molecular oxygen for periods of up to 12 months upon hydration. This newly available source of oxygen is available for aerobic microorganisms to metabolize along with the unwanted petroleum hydrocarbons.